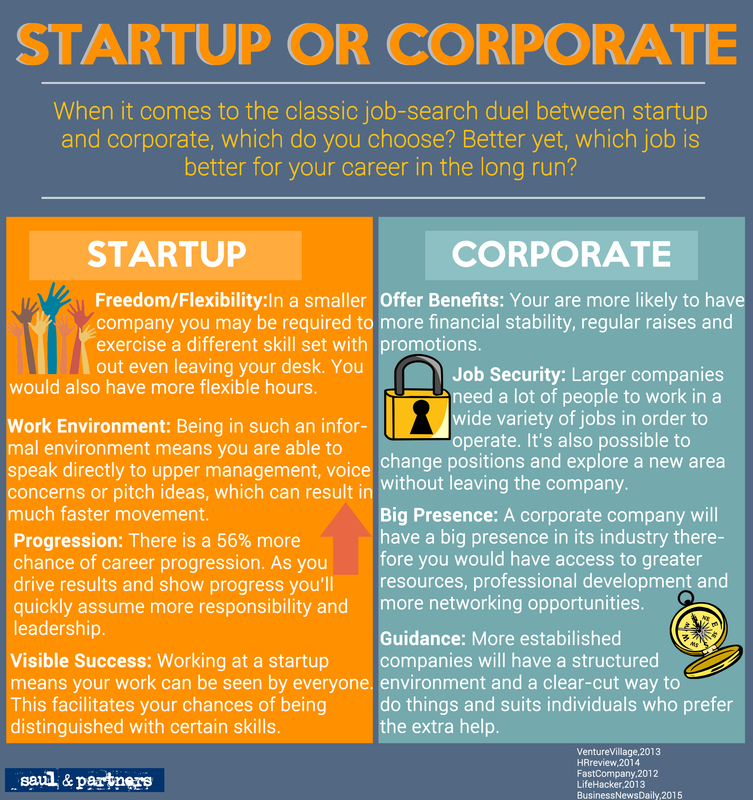 When it comes the classical job-search duel between startup and corporate which do you choose? Better yet, which job is better for you career in the long run? You probably know the basics of each type of workplace: Large companies have set hours, but startups are more flexible. Large companies offer benefits whilst startups will offer you free food. But what’s not really talked about is what does each workplace have to offer and how can I use these qualities in order to better benefit my career in the future? For example, a startup may give you quick career progression but how far up the ladder can you really go? A corporate job may give you the guidance and a more structured job training, but will it give you the creative thinking skills required for you to one day start your own business? These are but a few of the questions you should ask yourself when thinking about which route you would like to take. The infographic will outline some of the benefits of working for either workplace, and hopefully give you some more knowledge so that you can decide on the right environment for you. You can look at our vacancies page for jobs in either workplace.